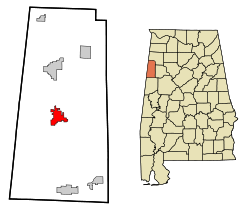 Vernon, Alabama is a city in Lamar County, Alabama. The city is the county seat of Lamar County, and previously served as the seat of its two predecessors, Jones County (not to be confused with Covington County), which briefly existed in 1867, and for Sanford County from 1868 until it was renamed Lamar in 1877. It incorporated in 1870. At the 2010 census the population was 2,000, down from 2,143 in 2000. It is the largest city in Lamar County as of 2010, and previously held the distinction in 1880 and from 1960-1990, falling to 2nd place in 2000 behind Sulligent, but since reclaiming the title. Vernon is located at 33°45′23″N 88°6′41″W (33.756414, -88.111409).